Artist’s illustration of the SES-10 communications satellite in Earth orbit. The satellite is scheduled to launch March 30, 2017, atop a SpaceX Falcon 9 rocket whose first stage has already flown to space once before. The liftoff will be SpaceX’s first that employs a used booster. When it comes to innovation, satellite operator SES aims to practice what it preaches. The SES network currently includes 53 satellites in geostationary orbits about 22,000 miles (35,400 kilometers) above Earth as well as the 12-member O3b network, which is in medium Earth orbit about 5,000 miles (8,000 km) above the planet. "The most important thing that we're looking at is that we are morphing from being a capacity provider into being a capacity provider and a managed-service provider," Martin Halliwell, SES' chief technical officer, said in an interview with Space.com. "We have to offer more to our customers; just offering capacity and walking away simply isn't sufficient anymore," he said. "We have to offer higher-value services into the marketplace." The idea is that a customer would come to SES with a plan for what it wants to do, and SES would offer the technical services to make that happen using geostationary satellites, the O3b satellites or a combination of the two. "We're not actually linking between the two orbits … but we are looking to see whether that would be appropriate for the next generations of satellites," Halliwell said. Much like SpaceX is upending the launch industry, the satellite industry is poised for similar disruption with upcoming mega-constellations of small satellites, such as OneWeb, the latest project from O3b founder Greg Wyler. OneWeb, which last month announced plans to merge with Intelsat, aims to provide high-speed internet services worldwide within the next decade. The merger with Intelsat, which currently operates a fleet of 54 geostationary satellites, is "part of the larger vision of bridging the digital divide by 2027," Wyler said. "We're getting the pieces in place to accomplish that goal." "It gives Intelsat customers an upgrade path that's never been done in satellites before, where their services will continue to improve year after year," Wyler said in an interview last month. "It's kind of a new concept in satellites, where your services get faster over time. "You'll know from the experience, but you won't have to do anything," he added. "It will enable a smooth upgrade path for the customers … similar to when your cell operator moves you from 2G to 3G to 4G to LTE and eventually 5G." SpaceX also plans to build and operate a 4,000-plus-member satellite network for high-speed internet, but the company has not yet released details about the project. Halliwell said he thinks the new projects will have an impact on the geostationary systems as well. "All of the manufacturers are having to look inwardly to say, 'Hey, how can we do things cheaper, how can we do things faster, make them more cost-effective?'" he said. The launch of SES-10 is the first of six geostationary satellites that SES plans to launch this year, four of which will fly on SpaceX Falcon 9 rockets. The company also plans to launch four new satellites for the O3b network this year. 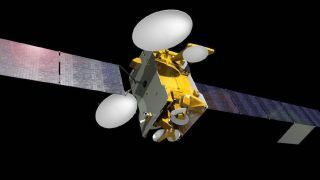 SES-10 will replace two other SES satellites to provide TV, internet and other services to Latin America.